Cauliflower Latkes make for a great meal or snack if you’re in the market for some tasty and satisfying low-carb eating options. 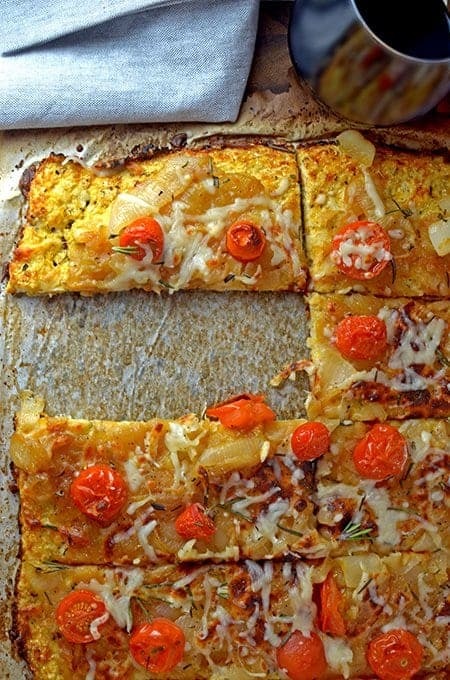 This recipe started out as a low-carb flatbread but because I doubled the amount of the cauliflower base, the recipe was not exactly a flat bread. Although the finished product was not what I had intended, it was good enough to enjoy for dinner a few nights ago and the leftovers made for a great lunch the next day at work. Might I just add that this recipe for cauliflower latkes pairs quite nicely with a nice glass of cab. 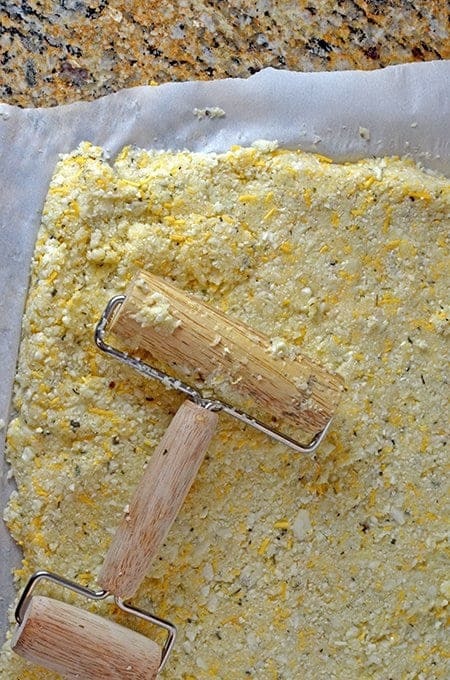 Eggs are added to the cauliflower to act as a binding agent. 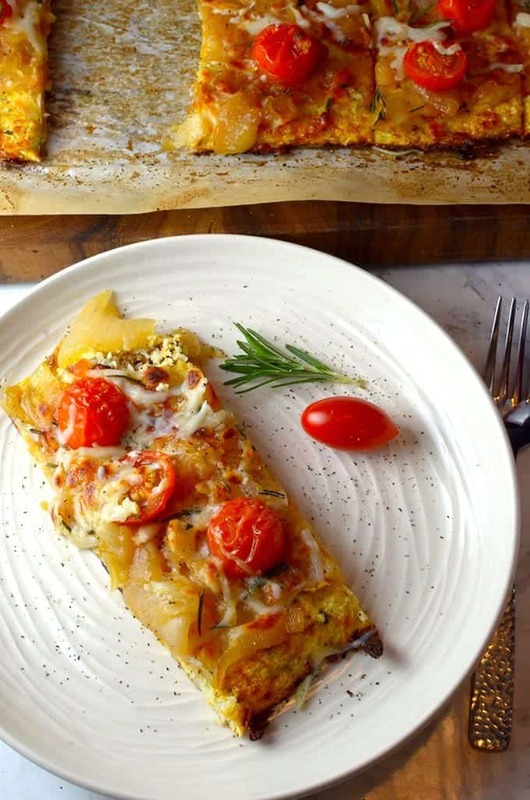 Whether you want to make some crispy and thin low-carb flatbread using cauliflower, or a batch of cauliflower latkes which are a bit thicker and softer, the ingredients are the same but with different amounts. 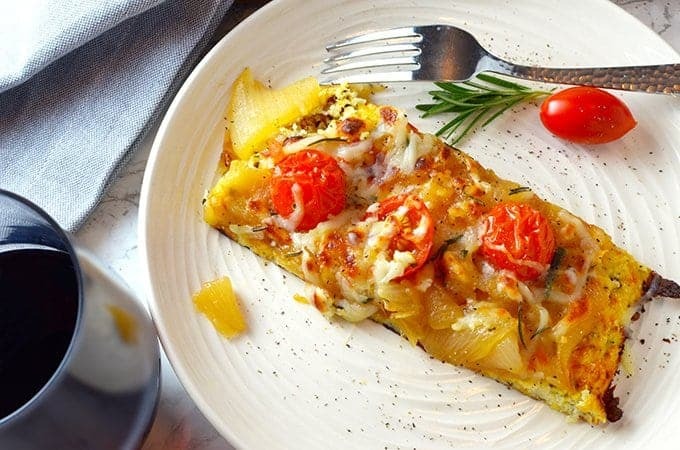 If you want to go the low-carb route, just use half the amount of eggs, cauliflower and cheese. With either the low carb flatbread version or the latkes version, I knew that I was going to use some fresh rosemary and cherry tomatoes. I love oven-roasted cherry tomatoes and the natural enhanced sweetness of the tomatoes from the roasting process was a wonderful topping to this low carb recipe. I also love using fresh herbs in the kitchen. 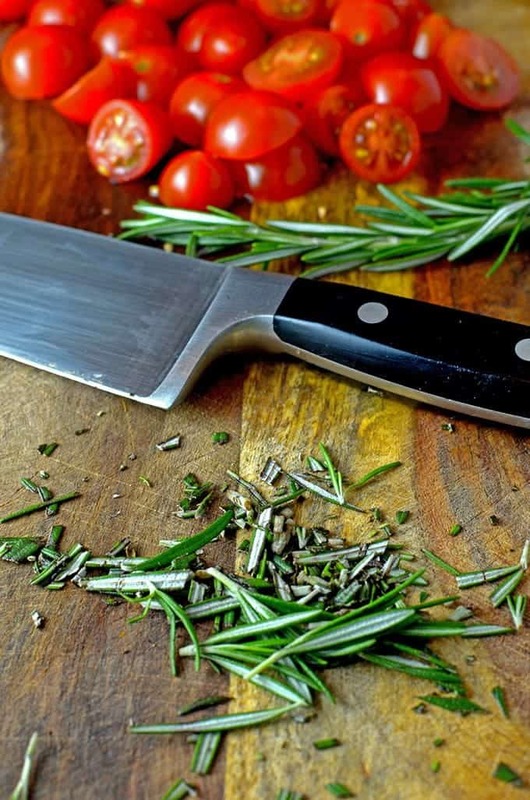 Rosemary is such a versatile flavoring agent, check out one of my all-time favorite Platter Talk dishes that uses rosemary, here. Caramelkized onions start like this. I have become enamored with caramelized onions and I think it all really started when I made this simple goulash recipe a few weeks ago. I love the structure and sweetness that caramelized onions impart to other ingredients. 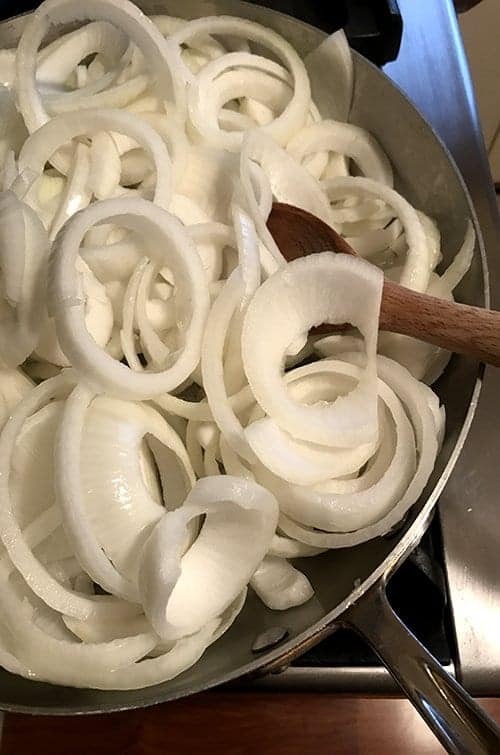 I found some great information from Food52, regarding the process of making caramelized onions and the different transformation that the onions undergo based on the length of time they are cooked. Click here to read the informative article. Squeezing as much water as possible, from the cauliflower. The cauliflower is sliced up and then placed in a food processor and shredded to a rice-like consisitency. Next, use your hands to squeeze out as much water from the cauliflower as possible. We use two heads of cauliflower in this recipe for latkes and sqeezed about two cups of water from each head. After mixing the base ingredients together, we roll it out on parchment paper and then we use a pizza peel to slide it on a hot stone for the oven. Using a preheated stone will help you achieve a nice crispy bottom for these cauliflower latkes. Kitchen Tip: Use a pizza peel like this one to transfer this (or a traditional dough) to a hot pizza stone. Be sure and have a taste of our other cauliflower dishes, they’re Deeelicious! Cauliflower Gratin Recipe in Horseradish Sauce. Cauliflower Latkes and Low Car Flatbread are two baked and grainless alternatives to traditional latkes. This recipe is for the latkes version, for flatbread, simply halve the ingredients for the base. Preheat oven to 500° F. Place baking stone on center rack. 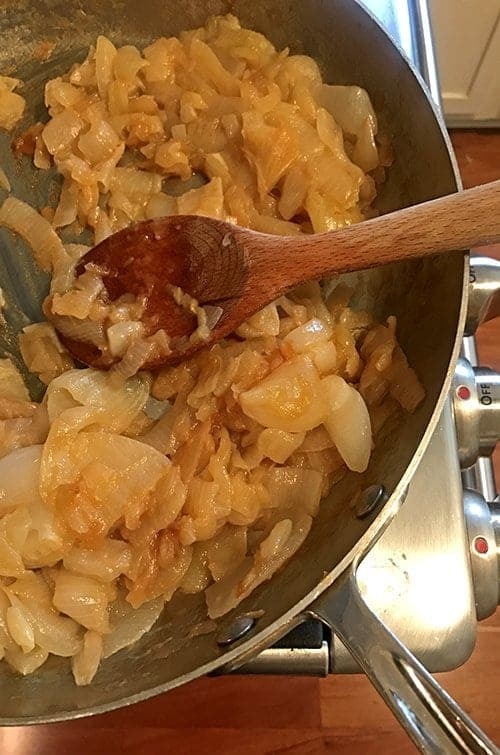 Caramelize the onions by placing the butter in a large skillet and melt over medium heat. Add onions and stir frequently with a wooden spoon. As the onions begin to caramelize and brown bits begin to stick to the bottom of the pans, add a teaspoon or so of water and continue the process until the onions have attained a dark brown color and a jam-like consistency. Remove from heat, set aside and prepare the base. Dice cauliflower into small pieces and place in food processor. Process to a rice-like consistency. 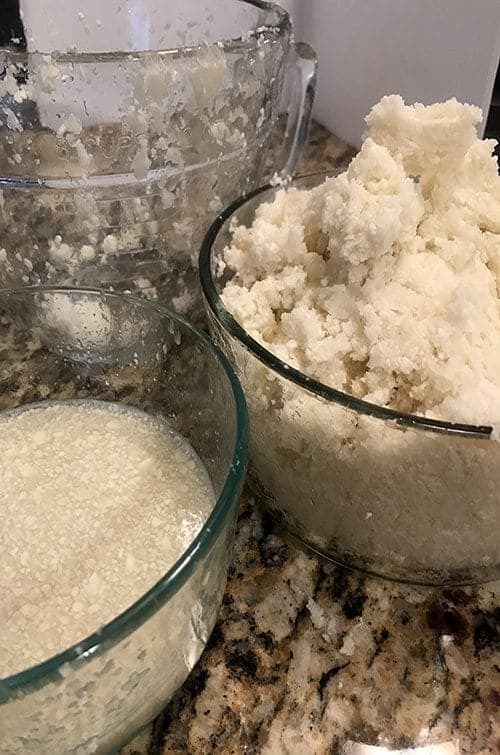 Remove the cauliflower from food processor and using your hands, squeeze out as much water as you can from the cauliflower. 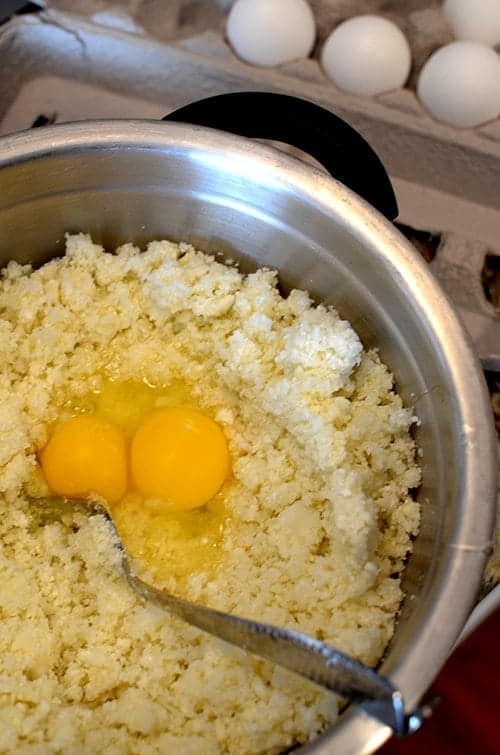 Placed dried cauliflower into a large mixing bowl and add the eggs, seasoning, and 1 cup of the shredded cheese. Thoroughly incorporate the ingredients. Spread cauliflower base on sheet of parchment paper. If making flatbread version, you want a thickness of about 1/4 inch. 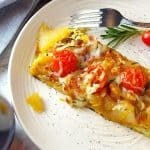 Use a spoon to spread caramelized onions on top of base, top with tomatoes, shredded cheese, and rosemary. Use a pizza peel to transfer the parchment paper (with the latke/flatbread) onto the hot stone in the oven. Bake for 20-25 minutes or until the latke/flatbread is a golden brown and crisp around the edges. Remove from oven, place on cutting board. Slice pieces and serve immediately. 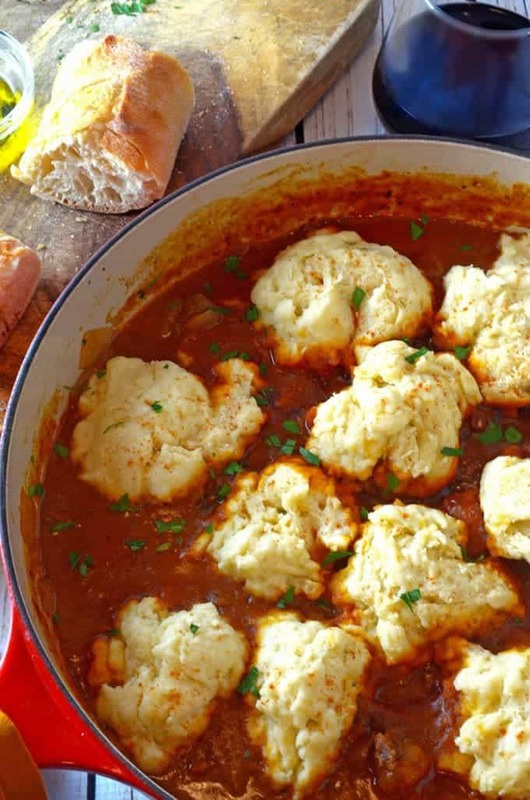 What a delicious new user of cauliflower and it’s low carb to boot! Win-win for me!! Thanks for the comments, Milly! We enjoy this recipe ourselves! Am loving this recipe! 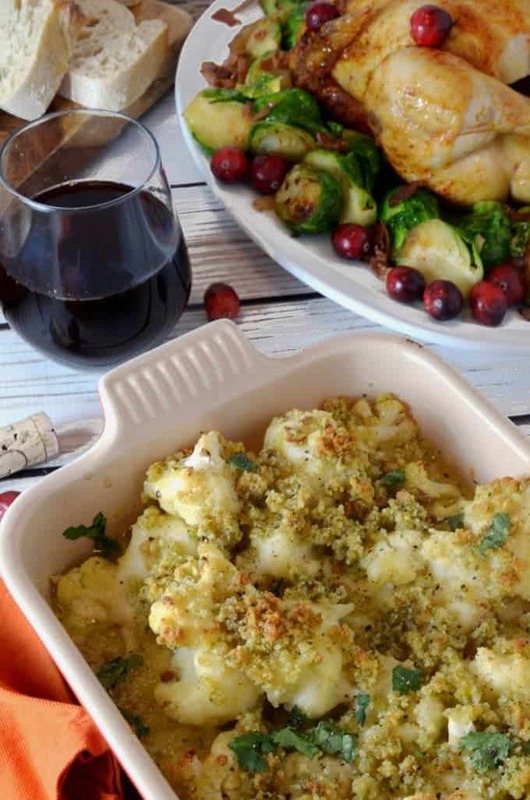 I adore cauli and am always looking for new ways to serve – thanks! Thanks so much, we love hearing from folks like you who find our recipes to be useful! i love cauliflower. I’m sure I’d love these latkes. But what’s with that double-pin roller? It looks so cool. This is such a creative way to use cauliflower! I love it, looks absolutely amazing!